Established in 1985, Crispin's Fine Foods is a catering company that has always produced the highest quality modern gourmet food. While the staff at Fine Foods have a strong international background and the capability of reproducing a number of cuisines authentically, we also take our cue from the cultural mix of California and French cooking techniques. 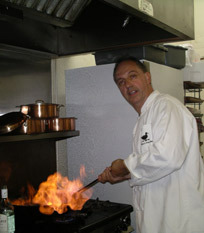 Chef/Owner Crispin Kitto moved back to California from his native England in 1983. He had previously lived in Los Angeles for three years when he was pastry chef at Wolfgang Puck's Ma Maison restaurant on Melrose. He had also worked with Indian food, health food and as sous chef in a Chinese restaurant. On returning to L.A. Crispin worked at Trumps restaurant under Michael Roberts, as pastry chef. While working at Trumps Crispin got involved in catering, first with Sheila Mack Gourmet Cooking (at that time probably the best catering company in L.A.), where he was head chef; and then with Sue Campoy in San Marino. In 1985 Sue opened Julienne with Crispin as head chef. In that year he also started Crispin's Fine Foods. While Fine Foods was getting off the ground, Crispin continued to run kitchens for Sue and other caterers including, Gai Klass, Nicole Cottrell, Andrea Bell and Sharon Singstock (whose business he took over in 2000, when Sharon married and moved to Georgia). Over the years we've catered all sorts of parties from small, intimate dinners through large corporate events. We are happy to co-ordinate weddings and other special events, organising everything from parking to location. Our focus has always been on really good food simply presented in a manner that allows the food to speak for itself. We use only the finest ingredients (organic whenever possible) from the best purveyors.